If I had to pick just one winery to have on a desert island, I’d be hard-pressed to think of a better one than V Sattui. It’s not just because the wine is good (which it is). But at V Sattui they also have an Italian deli and market (including wood-fired pizzas), picnic grounds and other amenities. In fact, if I had V Sattui on my desert island, I’m sure I wouldn’t be alone for long. We made it to V Sattui on our second day in Napa. We drove into the parking lot on our first day, and it was packed. 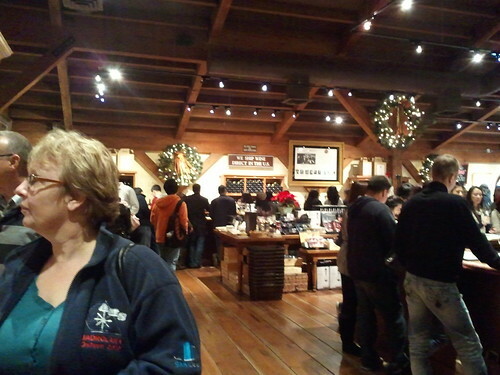 We were at the end of our tasting day and didn’t feel like dealing with a crowd. We tried again the next day, and although the lot was packed again, we found rock-star parking which we took as a good omen. Nikki adds: V. Sattui landed on our list because of Twitter recommendations from Jamie Hoover and Veronica Belmont. Then we arrived in Napa, and at our first meal our server called V. Sattui “the WalMart of wineries.” That made us hesitant. In the end, we decided that we had to go for two reasons: we’d gotten recommendations from two great people, and we hadn’t yet visited a tasting room that was so large or had so many customers per day flooding in and out. The scale of the tasting room means that tasters must pay upfront before the tastings rather than paying when they’re done. Frankly, it would be unmanageable any other way. They didn’t do the tasting-coupon thing that is so prevalent in Livermore, however. The place was hopping. But even though there were lots of people everywhere, having picnics, enjoying the scenery, going in and out of the tasting room, we managed to get a spot at the tasting bar right away. It never felt crowded; rather, it was like being at a big party. After our tasting we picked up some tasty noshes from the deli and enjoyed a picnic as the sun dipped toward the horizon. I’m glad we made a second effort to visit. 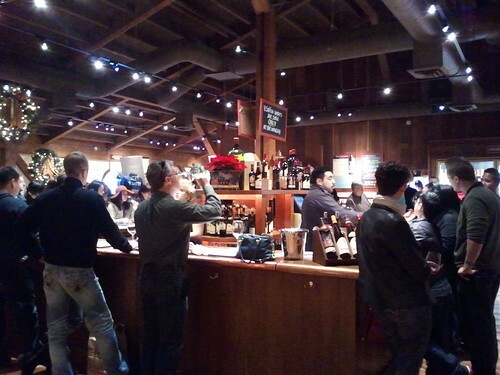 … and the tasting room. This was one of the three or four tasting bars in the facility. It was the final stop on our Napa trip, so it was our last chance to spot any of the legendary snobbiness we’d heard about. And we failed utterly. Maybe we just didn’t go to the right places, but the concept of the Napa snob now seems like a bit of an urban legend – perhaps it has some roots in a long-past reality, but now it’s just a story used to scare children around the campfire. 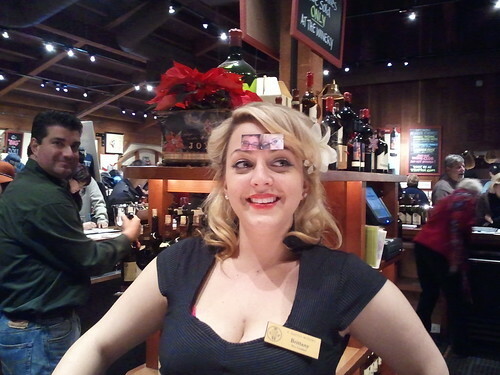 Brittany, our Tasting Room Associate, was a much better representative of the attitudes we experienced on our trip. She was gregarious, informative, and she took very good care of us. Nikki adds: I described her in my notes as “charmingly punk rock.” She was absolutely delightful. And she’s willing to get a little goofy. I must confess that my palate was getting a little fatigued by this point (plus, V Sattui has a very deep wine list we tasted about 400,000 wines here Nikki adds: it was wine tasting as endurance sport), so my tasting notes may lack detail. This is not a reflection on the wine, which was of uniformly high-quality. 2009 Vittoro’s Vineyard Sauvignon Blanc (Napa Valley): An appealing aroma greets you with the promise of tropical fruits and grapefruit. The flavor fulfills that promise; it’s well-balanced, producing a very drinkable wine. 2007 Sattui Family Chardonnay (Santa Lucia Highlands): The aroma was mellow but not buttery. The flavor had a bit more edge to it, fruity with just enough acid and a hint of bubblegum. It also hinted at other classic elements one expects in a Chardonnay. Nikki adds: No surprise there; these grapes were grown practically in our backyard! 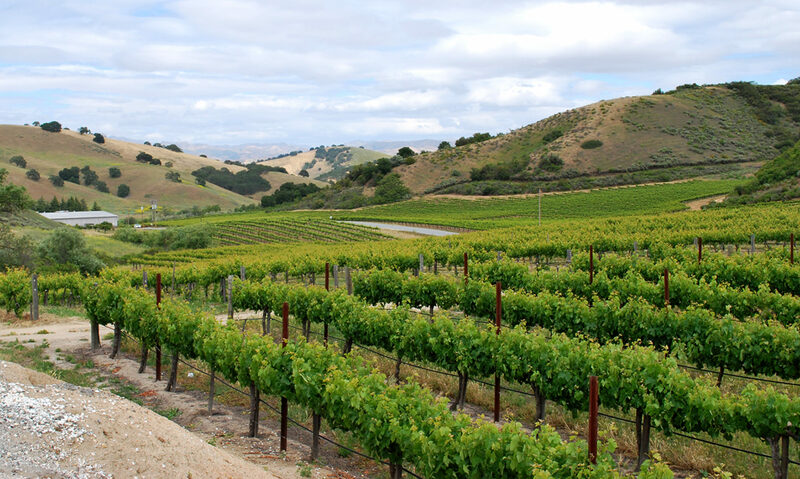 Santa Lucia Highlands is a Monterey County appellations, and we do great Chardonnay here. 2010 Estate Grown Riesling (Alexander Valley): I got raisin and pineapple in the aroma. It smelled rather like a dessert wine! The flavor was delicious with a nice sweetness to it, with tropical fruit and stone fruit – a touch of peach and apricot. Nikki adds: This was a little too sweet for me, but it would be the perfect steppingstone for the person who has begun their wine explorations with White Zinfandel. 2010 Dry Riesling (Carneros): This had a richer aroma than the previous whites, with less brightness. On the tongue it was almost effervescent and had a nice melange of pear, melon and lemon. Both of these Rieslings would be delightful to sip with friends on a summer afternoon. Nikki adds: This wine would be great with something spicy like szechuan or the hotter Indian dishes. 2010 Gamay Rouge (California): Sweet, delicious, easy-drinking. Nikki adds: This was also very reminiscent of a White Zinfandel, with a little more complexity. 2007 Monastero di Coriano Sangiovese (Tuscany): Brittany called this wine “Butch-tastic!” and I’d have to agree. Definite notes of leather, tar and tobacco, although with just enough restraint. I found it to have a good body, with a flavor that was not too sweet nor too tannic. I noted that this would be excellent with bold, spicy or meaty foods. Nikki adds: This 100% Sangiovese wine is from grapes that are imported from Tuscany rather than grown in California. 2008 Mount’s Vineyard Zinfandel (Dry Creek Valley AVA): The aroma displayed both fruit and tannins. On the tongue it was very smooth with a hard-candy quality to the fruit, framed by tannins at the end. 2009 35th Anniversary Zinfandel (California): Nikki notes: Though Vittorio Sattui began making wine back in the 1800s, the original winery was shut down by Prohibition. The current winery was founded by his great-grandson Dario in the 1970s, and this wine commemorates the 35th anniversary of the re-establishment of the winery. Less fruity, but nice. Nikki adds: The smell made me think of cherries sauteed over a birchwood and pine fire. When I tasted it, I got a lot of raspberries and an acidic hit. 2007 Merlot (Napa Valley): Smooth, mellow, nice tannins. Nikki adds: My notes say: “Spicy like a Thomas Dolby song.” This one, in fact. 2009 Syrah (Napa Valley): Juicy! Lots of fruit. Big tannins fit nicely. Hint of vanilla or caramel. Bold, chewy, serve with bold foods, steak. 2007 Cabernet Sauvignion (Mt. Veeder AVA): Great color, vanilla and cedar notes in aroma and on palate. 2007 Preston Vineyard Cabernet Sauvignon (Rutherford AVA): Pleasant, mellow fruit, with nicely balanced tannins. 2009 Muscat (California): Gorgeous aroma with melon and tropical fruits. The flavor reveals melon, star fruit, lemon and key lime. A little on the dryer side of the Muscat sweetness spectrum. 2010 Moscato (California): The aroma here is quite similar to the ’09 Muscat. The flavor is also similar, but a bit richer at first. There’s also a bit of an effervescent feel, although it’s not a sparkling wine. Madeira (California): I got a nice warm sugar aroma here, a little spicy, plus plum. The flavor is warm and beautiful, with notes of caramel corn and mixed nuts. Nikki adds: This is the oldest Madeira produced in Napa. 1998 Port (no AVA): Rich, sweet and delicious with the flavor of chocolate and just a hint of bell pepper. Nikki adds: Smells like a pipe-smoke-filled library (leather chairs and all) and has a somewhat syrupy quality. 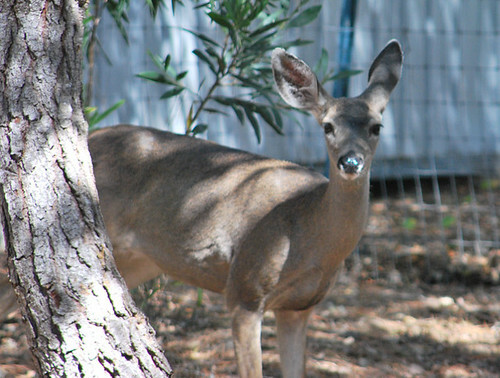 Thanks, greater Napa area, for a wonderful experience! We’ll definitely visit again.